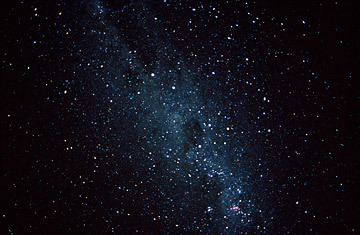 Southern Hemisphere, including the Southern Cross, the Pointers (middle) and the Coal Sack. We all recognize a galaxy when we see one. Doesn't matter if it's a swirling spiral or a formless clump. Gargantuan telescopes and four decades of George Lucas have made things simple: if it's far, far away, frosted in shimmering haze, and  most important  sprinkled with loads of glittering stars, then yeah, it's a galaxy. Alas, no more. For the first time, scientists have found proof that some galaxies are, gulp, entirely starless  virtually invisible cosmic islands composed of gas and dark matter but nothing else. A galaxy without stars seems a little like a cloud without water vapor  lacking the very thing that is supposed to define it in the first place. But a group of scientists have recently discovered at least a dozen such cosmic oxymorons, and in a paper just published in Monthly Notices of the Royal Astronomical Society argue that dark galaxies may actually represent a critical stage in galactic evolution, making some of the biggest, brightest galaxies possible. "These are infant galaxies at a very early stage," says Sebastiano Cantalupo, a postdoctoral researcher in astrophysics at the University of California, Santa Cruz and the paper's lead author. "As astronomers, we believe big things form from small things." Dark galaxies have long been a part of galactic theory. In order to build stars, a pre-galactic cloud needs a mix of ingredients, particularly hydrogen, helium, dust, metals and very heavy elements. But there's no guarantee that every cloud that swirls into existence will have that whole shopping list. You might get hydrogen, you might get helium, you might get some dust. That means, as Cantalupo says, that there would be "no efficient star formation." Such an invisible mass would be an awfully hard thing to hunt for, but Cantalupo and his co-authors Simon Lilly, from the Institute for Astronomy in Zurich, and Martin Haehnelt, of the Kavli Institute for Cosmology in Cambridge, England, tried a wonderfully simple technique to get around the problem: if the front yard has no light, use the neighbor's. In this case, the neighbor would be a quasar  a black hole-powered object that radiates brilliantly intense visible light, radio waves, and other forms of electromagnetic energy. In the southern hemisphere's constellation Sculptor, Cantalupo and his colleagues targeted a quasar he refers to as "the phone number" due to its eye-glazing name: HE0109-3518. But such a dreary descriptor hides the quasar's flashier qualities, particularly its extreme luminosity, which is 100 trillion times greater than our sun's. The quasar's intense light would make hydrogen gas in any neighboring dark galaxies glow like a haunted house skeleton, shedding light at a very specific ultraviolet frequency. U-V light should not be visible to us at all, but HE0109-3518 is a whopping 11 billion light-years from Earth, so distant that the light is stretched to a visible frequency as it travels across the universe. From here, it appears as an extremely faint shade of blue-violet. Using spectrographic mapping and a series of long-exposure images that included a four-night, 20-hour session captured by the Very Large Telescope (VLT) in Chile, Cantalupo's team initially filtered every object that didn't emit ultraviolet light at the desired frequency. They further narrowed their search by selecting only those objects radiating exclusively at the selected wavelength  meaning they shed no other light. "We know most galaxies emit [other] light and color while our sources only emit light at that particular frequency, that particular color," Cantalupo says. "So the dark galaxies we were looking for are only present in that filter." Applying these standards, the team detected more than 30 candidate objects, but because many were extremely faint, they whittled their dark galaxy candidates to just the 12 brightest. That still left them with clear examples of what appear to be the first dark galaxies ever confirmed  from a total of zero before. There are limits to what the astronomers can learn about the galaxies from these faint violet fingerprints. Since the quasar illuminates only a portion of the overall cloud, it is impossible to determine size or shape. Even with visible galaxies, that's not always easy. "The shape of a galaxy always depends on how deeply you take your picture," Cantalupo says. "Galaxies don't have sharp edges. They can be much more extended than what you see in the pictures." Nonetheless, the researchers' initial estimates put the "protogalactic clouds," as their report refers to them, as similar in size to the southern hemisphere's Small Magellanic Cloud  a dwarf, as galaxies go. Since the new-found galaxies are each within 10 million light years of the quasar (right down the block, on a galactic scale), they too are about 11 billion light years from Earth, meaning the astronomers obtained a heady view of the objects as they looked 11 billion years ago. The universe was still in its formative stages at that time, a mere 3 billion years old. In the long course of the eons since, the dark galaxies may have served as building blocks for bigger, bright ones, nursing them with gases that later combined with heavy elements, transforming the potent mixture into immense, nascent star fields. Another planned observing session with the VLT this fall should produce additional information about Canatalupo's dark dozen. He and his team also hope to use Hawaii's Keck telescope to search for more such objects in the northern hemisphere. "The first study was really just discovery research, to demonstrate that the technique works," he says. It clearly does, and while the formations he will likely find next will never be the stuff of grand galactic photography, they will shed their own kind of light on how their more-glamorous cousins came to be.